Who will win on Saturday in the McGregor vs. Mayweather fight? 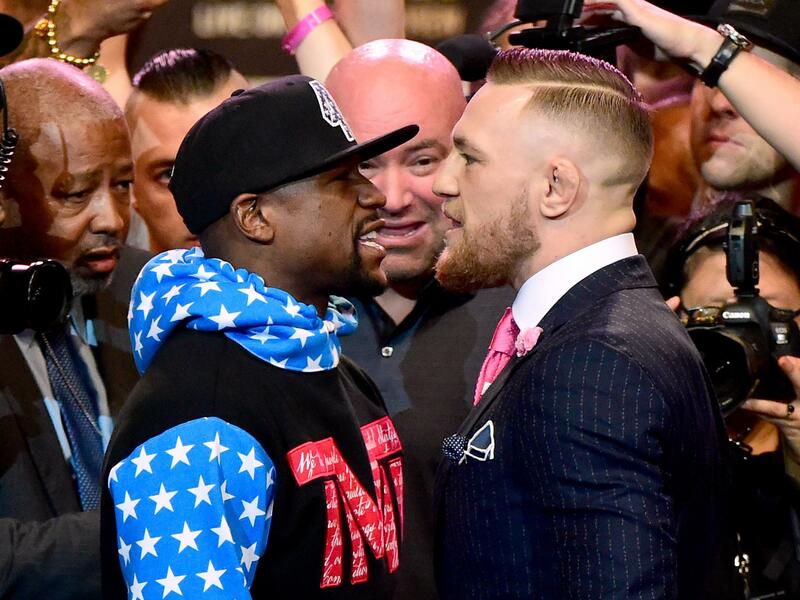 Mayweather will win… But it will be interesting. And that’s the point. Here’s my prediction of what happens, and an explanation of why, written up like a news story I imagine people will write on Sunday morning. Disclaimer: I know next to nothing about boxing or MMA. I’ve come to a tentative prediction from watching both men’s thoughts (in interviews) and fights on YouTube. Mayweather wanted to retire 50-0, and make a boatload of money one last time. He wanted a safe fight he can win easily, but he didn’t want to seem like he was playing it safe. He lighted upon a cocky underdog opponent who actually has 0-1% chance, and made it seem like the underdog has a real 30%-40% chance. He played up the fight, “giving concessions” like 8 oz gloves. He played up the hypo, loving the drama, enhancing the drama, earning free publicity, and grew the hype as big as it could be. He let McGregor fans, Irishmen, and underdog lovers the world over hope for an upset. In the ring, he enacted his time-tested formula. McGregor had to attack. He either missed and grew tired, or connected and grew tired. McGregor is used to opponents buckling under a couple of good counter-left punches, so he can finish with a “ground and pound.” But Mayweather didn’t buckle. Mayweather dodged a few, and took a few on the chin. But he didn’t get stunned like Mcgregor is used to. Mayweather even seemed to pretend he was more stunned he really was. He survived rounds 1-4, and McGregor lost steam. McGregor hoped it would be over by now, and, being discouraged, began to take hits. Rounds 4-8 Mayweather clearly dominated, earning technical hits and becoming more aggressive as it became clear that McGregor could no longer counter with that vicious left-hook. McGregor grew more and more fatigued and Mayweather pummeled him until the end of round 12, taking only a few return jabs for his trouble. Mayweather wins on technical knock out, retires fabulously wealthy at 50-0. McGregor spins the loss by saying that “if it were a MMA fight, I would have won”, walks with his $50 million, happy as can be, and goes back to UFC. Mayweather is a cautious investor first, a boxer second. He’s not just a defensive boxer, but a defensive person. He lives life on the defensive, cautiously, carefully, intentionally. He has used boxing as his vehicle for accumulating capital with which to invest in real estate, branded businesses, and other less reputable enterprises. But the way he boxes is the way he lives outside the ring as well. That goes to show that Mayweather chooses his fights just as carefully as he fights them. He has won 49 fights. He has not been defeated. How has he won 49 fights? He can punch, of course, and “wake you up” as one opponent said. Early on, he can counter punch to make you wish you weren’t so aggressive. But even his counter punches are not intended to knock you out, which only happens 50% of his fights. His counter punches are intended to annoy, frustrate, and ultimately distract you from the fact that you are losing energy fast, while he is not. Once you are out of energy, fighting sloppy, and frustrated, Mayweather can either use his professional precision to pile up points for a technical win or go full steam, and attack the head and body for a KO. Using this formula, combined with amazing speed and athleticism, Mayweather has out-thought and out-fought 49 opponents, including world-class fighters such as Pacquaio, Sosa, De La Hoya, and more. At the same time, using this formula, Mayweather has refused fights that he didn’t know for sure he could win. He refused to defend his title in 2015, even though he did take another fight shortly after. Presumably, he predicted his defensive formula would not work. If you’re Mayweather, and you’re getting older, you have a record of 49 and want 50 wins before you retire. So the last fight has to be good. It has to be believable. It has to be a big event. But, if you know Mayweather’s defensive approach, it has to have a clear plan to victory, using this tried and true formula. Mayweather is using Conor McGregor. Mayweather needed a fighter who was (a) good publicity, (b) skilled enough to seem like a good competition for undefeated Mayweather, but (c) foolish or inexperienced enough to not actually be much competition. Conor is all those things. McGregor is entertaining, cocky, and a good promoter outside the ring (or octagon). Inside, he’s a very good fighter. Also, although he has lost fights, he hasn’t lost in awhile. Mayweather knows that Conor’s cockiness will make good entertainment, build hype for the fight, and make it seem that he (Conor) has a chance. That will mean big money, huge money, 100 million dollars worth of money. That said, several points tell against McGregor’s chances, even in the age of Trump and Brexit. First, boxers usually beat MMA fighters in boxing, and MMA people usually beat boxers in UFC. But more importantly, McGregor is a perfect fit for Mayweather’s formula: Conor is used to short fights. He says he is training for a full 25 minutes but he also boasts that he will put Mayweather down within 4 rounds. Conor is cocky. He’s too cocky to take seriously his boastfulness, and we don’t really know how he will box. All we know is unless McGregor will out-muscle Mayweather, Mayweather will outsmart McGregor. And with 8-oz gloves, McGregor probably will not be able to stun and out muscle Mayweather, even if he can land punches on the notoriously slippery Mayweather. When you add that McGregor was willing to take the fight because it will “qaudruple his net worth”, a picture takes shape. Mayweather wanted to retire 50-0, and make a boatload of money one last time. He wanted a safe fight he can win easily, but he didn’t want to seem like he wass playing it safe. I guess on Saturday night, we’ll see!